We hope you enjoy visiting our website and viewing some of our items we have built. Please go to the In Stock items page for ready to furniture ready to ship or delivery Questions? Black Walnut Furniture is a company specializing in the design and construction of maple, cherry, oak and black walnut solid hardwood furniture. 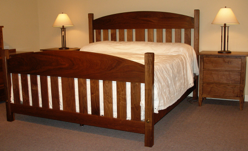 With our roots dating back to 1989, we use solid hardwood lumber construction in all parts of the furniture. 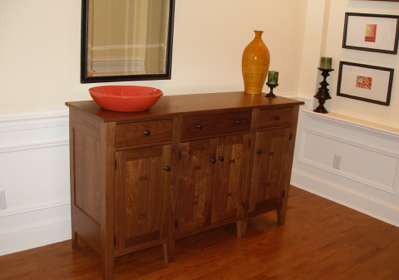 Our company is well known for our solid hardwood drawer bottoms, backs and inside panels construction. Customers may choose from items in stock, standard designs built and finished to order, or one of a kind piece designed to their unique specifications. We offer several categories of style, including craftsman, traditional and contemporary in a variety of hardwoods; featuring solid Black Walnut, Cherry, Maple, both flat and quarter sawn Oak, and Ash. What makes our furniture so unique? We generally use maple and ash lumber in the secondary wood panels; such as cabinet backs, drawer bottoms and interior panels. Where nearly all other builders of furniture use plywood, particle board, and MDF, Black Walnut Furniture insists on solid hardwood lumber in all aspects of construction for maximum strength and durability. As so often in construction, it is what you don’t see that is most critical to durability and function and is where cutting corners is so common to save in cost for the builder. Custom one of a kind pieces are a specialty!